Get Free shipping for states in the continental U.S. Shop Now! Get 40% off on 4* 8 ft. Auxx-lift Garage storage lift silver finish and free shipping, Shop Now! Save $640 on 4x8 ft. 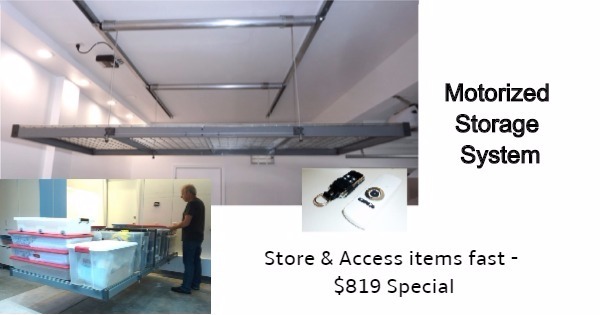 Premium Auxx Lift 1600 (600lbs) Garage Storage Lift - Silver Finish + FREE SHIPPING. Hurry Up! Auxx-Lift sell a ceiling-mounted garage storage lift. This motorized system raises and lowers for easy access of your storage items. It will beautify, declutter and modernize your home. Their lifts stores up to 600 pounds high above garage floor without using a ladder. Storage racks require one to climb around on a ladder with one's hands full and hoist items overhead on a rack. There is no easy finding and fetching with items blocking each other's access. It takes a long time to adjust the height, the access is unsafe and a long and tedious process. Auxx-Lift developed the storage lift, it makes fast, safe and easy access to your items possible. Found a coupon for Auxx-Lift?